After giving a very tough competition to other telecom companies with their free internet and calling service. Jio is all set to launch their Jio Gigafiber Broadband plan in INDIAN market, in which they are planning to offer a 3-month free welcome offer. 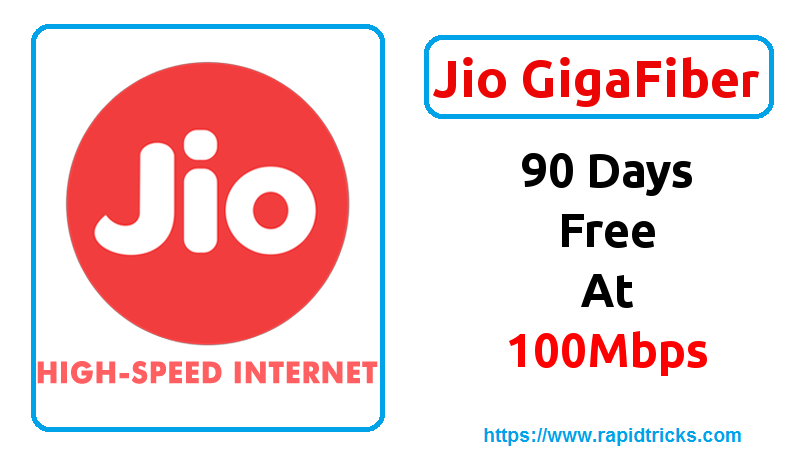 Let’s know about the Jio GigaFiber Broadband offer and Jio GigaFiber Welcome Offer in details. Reliance is in full action from last year since they have launched Jio 4G for free and that is also for six months, which is huge. After launching of Jio, the other Tele companies are sleepless because they can’t compete with Jio offers. All the telecom companies have seen a massive breakdown in their customers after Reliance Jio launch. Jio also became the first fastest Telecom company to reach 10 Crores customers in a short period. Jio is not in the mood to let their customers go after the free offer ends. So they are continuously launching affordable Internet and calling offers. Recently we have seen Jio is starting to Buy one get one prime offer and after that, they are planning to launch GigaFiber broadband plans. Currently, Jio is testing their GigaFiber broadband service in Mumbai, INDIA. After successful testing of Gigafiber Broadband, the company will be again providing a unique “Welcome Offer” to all their subscribers. Under the Welcome offer, Jio will be offering a three month of free broadband service at the speed of 100 MBPS. If the reports to be believed the Jio will offer their GigaFiber services in three variants which are Silver, Gold, and Platinum. The Jio Broadband Plans will be starting from Rs. 500. At 500 Rs. Plan customer will get the speed of 15 MBPS and the plan will have 600 GB data limit which is huge. More plans from jio Gigafiber Broadband service are given below. Jio GigaFiber Broadband service is expected to launch by mid-2017, are you excited about the Jio Gigafiber Broadband service? Let us know in the comment section below.